The government’s ambitions for higher education to improve life chances will only be met if university leaders make tackling inequality a core part of their mission. Our report, Supporting thriving communities: The role of universities in reducing inequality, identifies strategies for success in widening participation drawing on evidence from across the sector. It identifies collaborative outreach and working in partnership with schools as the most effective ways of supporting underrepresented groups to apply to university. It also backs a continued strong role for the functions of the Office for Fair Access (OFFA) and bolstering the National Collaborative Outreach programme when the Office for Students comes into being. 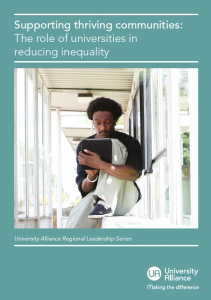 The report goes beyond access to look at retention, progression and graduate success – and sets this within the context of universities’ wider contribution to tacking inequality in their cities and regions, which deserves to be recognised and championed. You can read our full press release including recommendations from the report here.